August’s beautiful Installation of the Month is by Pip and the team at NV Integration. 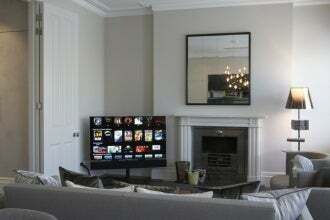 The client requested simple control of all the AV and lighting, with the main lounge system being a high-quality TV system in this stunning, luxurious property in London. Aesthetics and discretion were of equal importance as the performance and as such, an Artcoustic Multi SL Soundbar the same width as the TV was installed elegantly under the TV screen to provide high-quality LCR audio. Architect SL2-1 were installed in the ceiling for rear channels in this simple 5.1 TV system, with a panel sub micro hidden from view behind the furniture. The result is wonderful. Elegant and discrete with high performance. The perfect TV system. Multi Soundbar SL; Artcoustic pioneered the concept of an all-in-one left, centre and right (LCR) soundbar as far back as 1998, and the SL version is an evolution of this classic loudspeaker. Available in four standard size versions, all feature clean, discrete aesthetics with high output timbre matched performance. They can be used as a single LCR loudspeaker, or for more powerful systems, used as a single mono centre channel. The standard sizes are designed to complement today’s flat screens. Bespoke width options are also available. Image: An Artcoustic Multi SL Soundbar the same width as the TV screen provides elegant, discrete and high-quality LCR audio. Photo: courtesy of Artcoustic.